You guys, I won’t sugarcoat this: Finding the right business name is SO. HARD. Maybe it’s just me, but the multiple times I’ve done it have involved a lot of missteps. I’ve come up with some pretty weird business name ideas over the years. Lucky for you, though, I’ve gotten better at it. I’ve even created a whole process for brainstorming and deciding on a winning name. 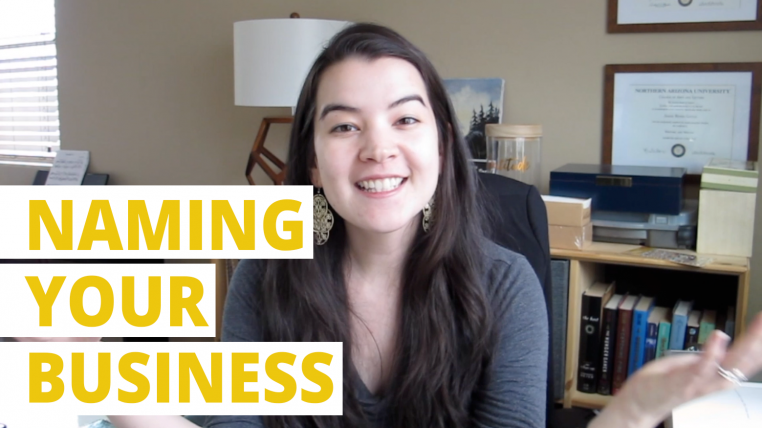 Here’s the video breakdown on my business naming process and how I settled on Copykin Editing Co. Don’t have time for all the details? Want to just READ something? I’ve pulled out a few key highlights below! Highlight #1 — Do you even NEED a business name? Plot twist: Maybe not. If you’re a freelancer, you’re probably good with just your given name. Using a business name when you don’t need it might add confusion. The exceptions? If you have a really common name, a really hard to spell name, or plans to build your business into a multiple-person venture (such as an agency). Start with the obvious stuff. When I was naming Copykin, these were words like “writing,” “pen,” “ink,” “scribe,” etc. Then, move onto the conceptual stuff. What angle are you going for? What makes your business different? One route I went down was the idea of copywriters and copy editors being kind of like family. I brainstormed words like “group,” “kin,” “clan,” “tribe,” etc. Go nuts with the brainstorming, and you’ll have lots of words to play with when it comes to trying out combinations. You type in a word, it spits back a bunch of available domains that include that word. Great for brainstorming ideas and checking availability at the same time. It’s like falling in love with someone wearing a wedding ring. Awful idea. Create a huge list of potentials, then try them all out at Namecheckr. You put in your business name idea, and the website checks if the domain and social media handles are available. Tip: If it costs more than $30 to buy the domain or you’ll have to really butcher the name to get an available social media handle, it ain’t worth it. Trust in your creative abilities and keep brainstorming. Want to keep up with my latest videos? Come follow my YouTube channel! Hello! I really enjoyed this article. I have subscribed so I can keep with new posts. Great and very helpful post. Thinking for a business name in this dimension truly helps in a great business. Thank you for sharing the post.